Caption slip reads: "Photographer: Monteverde. Date: 04-18. Reporter: Brown. Assignment: Greek Good Friday -- Helenic Orthodox Church of Annunciation. General view: Rev. Anthony Kosturos (L) and Rev. 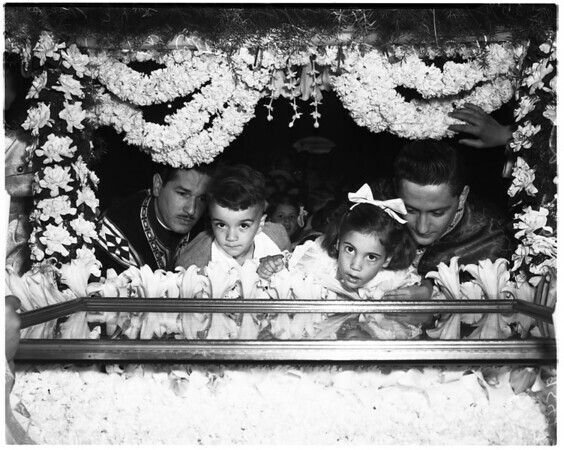 Leonidas Contos, rector, with children before bower depicting Christ's tomb. l/r: Fr. Contos, Catherine Diane Lekas, 5, Demo Bonos, 3 1/2, and Fr. Kosturos at bower. Side view of children before 'tomb' with Fr. Kosturos (L) and Fr. Contos (back to camera)".